Digital and Social Media made easy! Will Google Glass actually harm our perception of the world rather than aid it? Who Is Using What In Social Media? Wealthy But Are They Healthy? 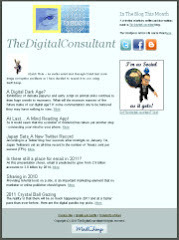 TheDigitalConsultant by Roger Smith is licensed under a Creative Commons Attribution-NoDerivs 3.0 Unported License.